In the space below, enter your "blog" for the following question. Choose 1 physical characteristic of Italy. In your own words, describe how this characteristic has impacted that area of Italy. Remember, there may be positive impacts and negative impacts, either way, they are impacts. There may not be more than two of the same characteristic described. Use the following reviewed websites for your research. 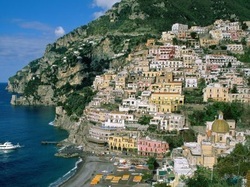 The Amalfi Coast "John & Jana-wedding website by myweddings.com." John & Jana-wedding website by myweddings.com. mywedding.com, 2010. Web. 1 Aug. 2011. .